Sir Leonard Charles Woolley (April 17, 1880 – February 20, 1960) was a British archaeologist, best known for his excavations at Ur in Sumer, ancient Mesopotamia (present-day Iraq). His work resulted in some of dramatic discoveries, including royal tombs, which revealed much about ancient Mesopotamian culture, including Queen Pu-Abi's jewelry and other beautiful, valuable items. The discovery of her well-preserved tomb allowed Woolley to reconstruct the nature of her funeral ceremony, which included the burial of her attendants, who died in order to continue serving her in the afterlife. Woolley's work also included findings of sediment that he believed were evidence of The Flood recorded in the Bible at the time of Noah. He suggested that the flood was actually limited to the region between the Euphrates and Tigris rivers, being the whole of the known world at that time, rather than a universal phenomenon. Although later research did not support his account fully, the possibility of finding scientific evidence of such a significant religious event continues to excite those who regard science and religion as complementary approaches to the discovery of knowledge about humankind. Leonard Charles Woolley was born in London, England. His father was a clergyman and Woolley initially followed his father’s footsteps. Woolley then decided to become an archaeologist, obtaining his degree from New College, Oxford. In 1905, Woolley became assistant keeper of the Ashmolean Museum in Oxford. Then, on the recommendation of Sir Arthur Evans, he became the first supervisor of the Corstopitum excavations at Corbridge in Northumberland, in 1906 and 1907, under the direction of Francis Haverfield. From 1907 to 1911, Woolley participated in an archaeological expedition to Wadi Halfa, Sudan, an area rich in Egyptian antiquities. From 1912 to 1914, Woolley started collaborating with T.E. Lawrence on the clearing of Carchemish, the Hittite city in the Sinai Peninsula (present-day Syria). World War I interrupted their work, but they re-started the excavations in 1919. Woolley described his work there in, Carchemish (part 2, 1921, and part 3, with R.D. Barnett, 1952). Woolley also worked with the Egypt Exploration Society in Tell el-Amarna, the ancient city of king Akhenaton. Woolley's work in the city of Ur began in 1922, continuing for 12 years, until 1934. He was in charge of the joint venture between the British Museum in London and the University of Pennsylvania, Philadelphia. The discoveries found at Ur made Woolley world-famous, and in 1935, he was knighted for his services to archaeology. In 1937, Woolley started to search for the link between Mesopotamian civilizations and those of Greece and the Aegean. This led him to the Syrian city of al-Mina, following by the Turkish city of Tell Atchana (ancient Alalakh), where he conducted excavations from 1937 to 1939, and again from 1946 to 1949. There, Woolley discovered the remains of a small kingdom dating from fourth millennium B.C.E. He described his finds in Alalakh, an Account of the Excavations at Tell Atchana in the Hatay, 1937–1949 (1955) and A Forgotten Kingdom (1953). Sir Leonard Woolley died in London, on February 20, 1960. Leonard Woolley remains famous for his excavations in Ur of the Chaldees, located south of Baghdad, in present-day Iraq. There, Woolley uncovered a cemetery of some 1,800 graves, with tombs of great material wealth. This was the burial site of Mesopotamian royalty. Inside the tombs were large paintings of ancient Mesopotamian culture at its zenith, along with amazing pieces of gold and silver jewelry, cups, and other furnishings. The most extravagant tomb was that of Queen Pu-Abi. It contained incredibly high quality items, extremely well preserved. Amazingly enough, Queen Pu-Abi’s tomb remained untouched by the hands of looters through the millennia. Inside the tomb, among the items found were a cylindrical seal bearing Queen’s name in Sumerian, a golden headdress made of golden leaves, rings, and plates, a superb lyre, complete with a golden and lapis-lazuli encrusted bearded bulls head, a profusion of gold tableware, and many other items. The Queen’s body was found buried along with her attendants, who had poisoned themselves (or had been poisoned by others) in order to join their master and continue to serve her in the afterlife, according to their belief and custom. Altogether, the bodies of five soldiers and 23 maids were found. Woolley reconstructed her funeral ceremony from the findings in her tomb. 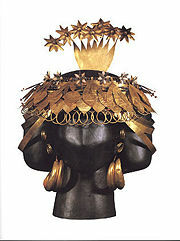 Her headdress, cylindrical seal, and her body are on display at the University of Pennsylvania in Philadelphia. Another important find was the Standard of Ur (also known as the "Battle Standard of Ur," or the "Royal Standard of Ur"). This is a Sumerian artifact dating from around 2600 B.C.E. Its original function is not conclusively understood. Woolley suggested that it had been carried on a pole, borne as a standard. It has also been speculated that it was the soundbox of a musical instrument. The artifact is interesting because it has two main panels, with pictures on each. On one panel is a picture of battle scenes, with four-wheeled chariots, armor, weapons, and the enemy. On the other is a scene of a normal life: A banquet feast with a parade of animals, singing, and war booty. The panels have been named, accordingly, “War” and “Peace.” The richness of the details on the panels has helped in understanding the way of life in ancient Sumer. The Standard of Ur required some reconstruction, as the effects of time had decayed the wooden frame and bitumen glue which had cemented the mosaic in place. The reconstructed Standard is housed in London's British Museum. This deluge was not universal, but a local disaster confined to the lower valley of the Tigris and Euphrates, affecting an area perhaps 400 miles long and 100 miles wide; but for the occupants of the valley that was the whole world (Ur of the Chaldees: A Record of Seven Years of Excavation: 31). In addition, added Woolley, according to Sumerian records in the Gilgamesh epic, some of the cities of the valley survived the flood. Woolley’s discovery was soon connected to other similar discoveries, especially the remains of the city of Kish. Theologians and people of faith used this as the evidence to support the flood account in the Bible. Further research, however, has provided limited evidence to this theory, claiming that sediments found by Woolley were extremely local, not even covering the whole of the city of Ur. Evidence for the Great Flood thus remains controversial. The discoveries Woolley found in the city of Ur had lasting effects on archaeology. They paved the way for an understanding of the ancient civilizations of Mesopotamia—their art, architecture, literature, government, and religious practices. Scholars were able to reconstruct the history of the city of Ur starting from its formation in prehistoric times (circa 4,000 B.C.E.) until its final days in the fourth century B.C.E. The artifacts Woolley uncovered were among the most beautiful and the best preserved of all from that historical period. The excavated treasures from Woolley's expedition were divided between the British Museum in London, the University of Pennsylvania Museum in Philadelphia, Pennsylvania and the National Museum in Baghdad, Iraq. Several pieces were looted from the Baghdad museum in the aftermath of the war in 2003. Several of the more spectacular pieces from Pu-Abi's grave have been the feature of a highly successful Art and History Museum tour through the United Kingdom and America. Agatha Christie, the well-known detective novelist, was inspired by the work of Woolley, especially his discovery of the royal tombs. She wrote her book, Murder in Mesopotamia, based on her experiences at the excavations at Ur, and later married Woolley’s younger assistant, Max Mallowan. Woolley, Charles L. 1929. Ur of the Chaldees: A Record of Seven Years of Excavation. Ernest Benn Ltd.
Woolley, Charles L. 1936. Abraham: Recent Discoveries and Hebrew Origins. Faber and Faber. Woolley, Charles L. 1954. Excavations At Ur: A Record Of Twelve Years Work. Ernest Benn. Woolley, Charles L. 1955. Alalakh, an Account of the Excavations at Tell Atchana in the Hatay. Society of Antiquaries. Woolley, Charles L. 1958. History Unearthed. Ernest Benn. Woolley, Charles L. 1961. Art of the Middle East Including Persia, Mesopotamia and Palestine. Crown Publishing Group Inc.
Horne, Lee. 1998. Ur and its treasures: The royal tombs. Expedition Magazine. 40(2). Klein, Richard G. 1990. World Book Encyclopedia. Chicago: World Book, Inc.
All links retrieved June 27, 2018. Excavations at Ur—Picture story of Woolley’s journey and excavations in Mesopotamia. Plan of Queen Pu-abi's gravesite—Photos and video of the tomb. This page was last modified on 27 June 2018, at 16:44.